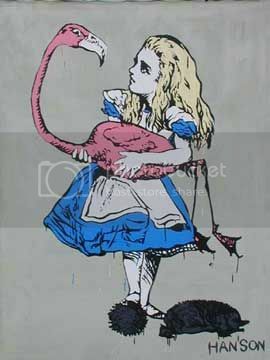 I'm a fan of "Alice in Wonderland" or, more specifically, I'm a huge fan of Alice's insatiable curiosity. Her wide-eyed approach continues to influence children and adults alike and, in my opinion, is a prerequisite for any worthy artist or scientist. It is both my love of Alice and my fondness for the spotted hyaena (Crocuta crocuta) that inspired me to name this blog Hungry Hyaena. "But what does that have to do with Alice," you may wonder. Below, I have excerpted from "Through the Looking Glass." Ever since I came over a hillock in Botswana and found myself "face-to-face" (in fact, the distance was closer to ten yards) with a large female spotted hyaena, I have felt a close tie to this species. They are brutal looking animals but, though most people consider them ugly, filthy creatures, I see something of myself in them. I'm sure to go on about spotted hyaenas in a later post, but what matters here is the image of Alice, that most creative and curious of souls, gnawing on a bone with her powerful hyaena jaws. She will be through to the marrow in no time. I want to have my DNA taken to the far ends of the Milkyway. Someone should order small plastic vials from the manufacturer using the green Thomas industrial catolog at the public library, look up vials /plastic. Next have someone make a kids rubber helium party baloon that is 1 inch bigger when its inflated so it goes higher in the sky. Have it made with glow in the dark stuff that shines at night. It will take two rubber baloons tied together to carry up the plastic vial taped to one of the baloons. Proceed to get poke-em lancets from the drug store to prick your finger. Now Space-Aliens flying in invisible craft in Earths skies could retrieve a drop of your blood when you release the baloons over the desert or nature park. Go ahead and dab a drop of blood onto the surface of the baloon instead if you want, then only one baloon is needed. Your baloon might be recognized by the Aliens up there. Or you might find the whole idea a bad thing. Should people who believe there is Aliens visiting our solor system send out a spacecraft way past Pluto that has a supply of fruit tree, vegetable and berry seeds so the Extra-terrestial star travellers can take it home?